Ant Species With Female Parthenogenesis? Have you heard the buzz about the fungus-gardening ant, Mycocepurus smithii? Apparently the queens can crank out workers and new queens without fertilization of the eggs. Genetic studies have shown the workers to be clones of their queen mother. No males have ever been found in nature, and laboratory colonies can’t be induced to make males either. Although in haplodiploid species males are usually generated without fertilization, this may be the first case of female ants being produced this way. Parthenogenesis is the development of individuals from an egg that has not been fertilized. Although more commonly known from aphids, a number of species of Hymenoptera are parthenogenetic as well. Recent studies have shown in some of these cases the absence of males is due to infection by a bacteria, such as Wolbachia. 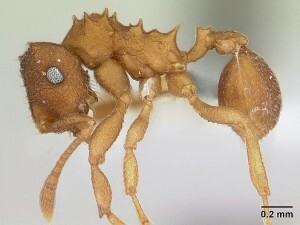 The ant researchers indicate that bacterial infection isn’t the case in Mycocepurus smithii. The consequences of asexual reproduction in these fungus-gardening ants are still under debate. Scientist Anna Himler has already suggested that there is a link between the ants and the fungus that grows in their gardens, because the fungus also reproduces asexually. We will probably hear more as these ants will certainly be given closer scrutiny.